I imagine it is giving this error because the eggs are displaying in Japanese? (Japanese OTs can only be 5 characters long. This is a dump of my NA emerald save, so my OT is able to be up to 7 characters long.) I have done nothing fancy with the egg. I just shoved a ditto and houndour in the daycare. As far as I can tell, all eggs revert to Japanese. 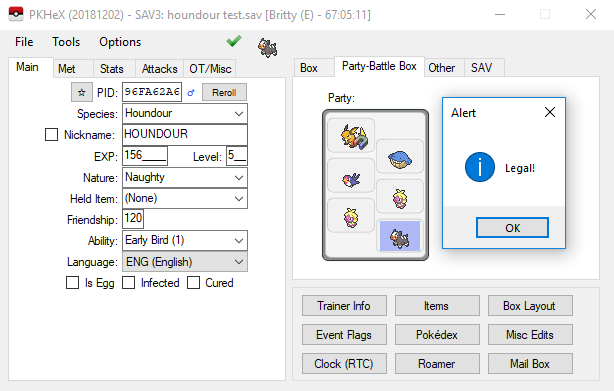 I'm not sure if it's just how the game generates the eggs which is why it's displayed as Japanese in PKHeX. 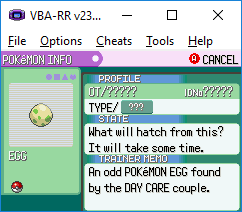 However, the egg displays English text in the actual game (both on the emulator and on cartridge) The legality error resolves upon the pokemon hatching. 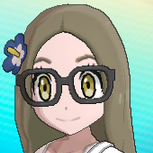 Also, I was told to remind by the end of the month (In November) if the Crystal movests weren't fixed. You mentioned to me that they were missing, and you weren't quite sure why. My quilfish is still getting spikes flagged. Figured I'd do it now since I'm reporting some other issues. In my original thread, Quilfish displayed fine for you, most likely since it wasn't a VC save. You should have my .DAT if you need it in the original PM. But here's the .pk2 anyway. 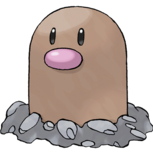 In Gen 3, eggs always have the word Egg (in Japanese) as the species name. The language field has a special value that localizes it ingame. IIRC, PKHex thinks that special value is Japanese. @Kaphotics, I never knew about those flags you noted. 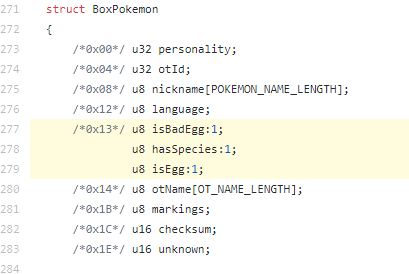 So if a language is 0x102, then it will be seen in-game as "Bad Egg"? I also didn't know the 0x600 could be separated because I never see a 0x400 flag used. Also no matter the language, an egg is ALWAYS 0x601. I tested 0x602 and others, and it doesn't localize properly. Or maybe you can clarify and I am just confused. They're separate bytes; just ignore the language portion. 02 is for 'FlagHasSpecies', which is true, the data does contain a species. This is essentially the equivalent of 'sanity' data for future games, as the data is outside of the encrypted&shuffled region, allowing for quick checking if the slot has data or not. Wow I never realized that. Interesting.